In terms of sheer numbers and star power, few musicians can match Houston’s own Grady Gaines when it comes to the number of musical stars that he has shared a stage with over the course of his 60-year career. Beginning with his mid-1950s stint as the band leader for The Upsetters, rock ‘n roll icon Little Richard’s legendary backing unit, and continuing as the leader of backing band for iconic singer Sam Cooke and through the 1960s, when The Upsetters became the go-to road band for a litany of blues and R&B stars on massively popular tours that crisscrossed the nation, Gaines has played behind an authentic who’s who of musical royalty. By his own count, Grady has performed on stage or in the studio with over 70 inductees in the Rock and Roll Hall of Fame. 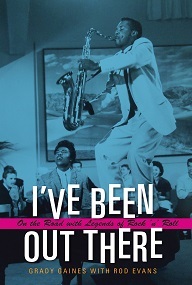 The book, “I’ve Been Out There: On the Road with Legends of Rock ‘n Roll,” is the fascinating, tell-it-like-it-is account of Grady’s remarkable musical journey. To order your copy, click the button below.